My bank has some new doors. They’re designed to increase security, I reckon. To stop people with guns and balaclavas rushing in and swearing and rushing out again with our hard-earned cash. This is a good thing, we need the bank to look after our cash. Not a trace of irony here. None. The trouble with the new bank doors is that, although they may well thwart the robber-hoard and keep our euro safely abed, they do nothing to ease customer passage in and out of the bank. In short, these new doors are just a massive pain in the hole. They act like an airlock. You go in the first set of glazed double doors and find yourself in a small lobby facing another identical set of glazed double doors. All fine. The trouble is that the second set of doors won’t open until the first set of doors are securely closed behind you. It’s for security, you see. If balaclava-ridden thuggies breach the first doors they will have to stand and wait before they can get through the second set and this allows some time for all sorts of buttons to be pushed and breasts to be clutched. Well done, the bank, you’ve done it, I reckon. You’ve defeated the robbers. Of course, in defeating the robbers you’ve also defeated the poor customers too. You’ve thrown out the baby-depositor with the bank water. The customers are bemused, deflated, outraged, frustrated and slightly-sweary about these doors. I can confirm this for I myself am a customer. Let me walk you through the new-bank-door experience. You arrive at the entrance to the bank. You have a small cheque you wish to deposit. Life is pretty darned good. 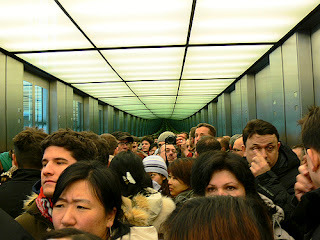 You are surprised to see that the area behind the glazed entrance doors into the bank is wedged with a human mosaic of people, all pressed up against the glass, swollen-faced and distorted. There’s a little square white button to the side of the door and you push it in that spirit of exploration and scientific betterment which drives practically all forms of human endeavour. The doors burst open and the trapped people all spill out from within onto the pavement at your feet. Rather like that little Kintner boy in ‘Jaws’ might have done if it had been the right shark and not just some number-plate-munching impostor from upstate. They pick themselves up, the spilled-people, dust themselves down and mutter-off into the irreparably-spoiled morning. A select few denizens of the between-door area have not fallen out because they were far enough back in the darkened bowels of the lobby to survive the intemperate horror of the door release. They now beckon you inside like hungry witches, their shrivelled fingers crooked in faux welcome. You object. You explain to them how you can’t really go anywhere until they come out of the lobby so why not just come on out and stop inviting you in? It’s only good sense but these lobby-lingerers don’t see it that way. It’s almost as if, in the small timescale they have spent in the bank lobby, they have become institutionalised and reluctant to abandon the unquestionable security of the betwixt-door area. You humour them, you enter the lobby and now the spell is broken and the welcoming residents suddenly understand the need to get out, to escape. They bombard you with their perambulators and their lollipop-drooling offspring as they make one final all-out bolt for freedom. Suddenly they are gone and it is just you in the lobby. Silence falls. The outer door eases slowly to that closed position which will enable the inner door to be opened via a similarly square and white button which currently mocks you with its imposed impotency. You watch the inner door swoon towards the consummation of its closure and, when it is within millimetres of completion, you turn to punch the white square button that will allow you into the inner sanctum. You punch the button. Nothing happens. What new hell is this now? You turn, the outer door is wide open again. Some megastar with no hair and milkbottle glasses has pulled the door open at the last minute. You shoot hostile glares and him which his thick glasses and his shiny pate simultaneously conspire to reflect back at you. He is remorseless or impervious, whichever, one of those things that annoying outer-door-opening people are. In a huff, you move to the outer door and try to make a silent point about your annoyance by trying to pull the door to a closed position before some other gobshite shows up outside. The door weighs exactly the same as those barbells which the Lithuanian Weightlifters attempt to lift for show right after they’ve secured the Olympic Gold Medal. You feel an ancient hernia pop somewhere deep down in your groin and still the door will only close at whatever speed it chooses. Finally it is closed and a new person arriving outside is accosted with a hostile glare of such magnitude that he falls away from the door in shock and awe. Meanwhile the Megastar has activated the inner door and has slipped away into the murky halls of banking. Now a new hoarde, trapped within holding their completed business slips for far too long, stampede into the lobby blocking your exit. Deaf to your protestations, they pull the inner door closed and this door responds much easier than the outer one ever would. Of course it does. You are trapped, trapped and now doomed to face the exit charge all over again. Not to mention the shock and awe merchant from outside who will derive much glee from informing you that he can’t go anywhere until you come out so please stop beckoning him in. The new double doors into the bank may keep my meagre money safer but I sometimes wonder if it is worth the cost in human misery that it extorts minute by minute by minute. It is a thing that is utterly without joy. Wait, I take that back. There is one joy. When you finally get inside and have joined the automatic teller queue and you have nothing at all to do for the next few minutes, it is fun to watch the people trapped in the maelstrom of the door lobby living the horror for themselves. That bit is quite good actually. Banks have long moved on from caring much about the customer. The cash-dispenser, located as it is, outside in the wind and the rain that we frequently enjoy, is one example. Not making payments to other banks, at the counter, is another example. And of course, protection from the robber is justification for just about anything else they care to do. I pity some of the staff. You can tell they are embarrassed by the goings-on. Others were so aloof before the changes were introduced, that the new way only serves to reinforce their attitude. So much of Irish (and perhaps world-wide) society has changed for the worse in the course of my lifetime. And lots have changed for the better too. One big change is in the broad landscape of the rights of minorities. Nobody can nor should attempt to deny equal rights, but in some areas a new inequality has occurred because the rights of minorities are given more weight than those of the majority. A balance needs to be struck to achieve a true equality. In the case of the threat of robberies, the customer shouldn't be discommoded in the way you have outlined above. Rather the judicial system should make it so unattractive for robbers in the first place, that we could all go on about our business in a reasonable way. My bank has no doors. Okay, it has doors but during opening hours they’re thrown wide open and you can wander in and out and in and out at your leisure. My bank’s situated in a shopping mall which is why but none of the branches I’ve ever been in over the years has had anything fancier than a plain ol’ glass door and I wouldn’t have it any other way. We don’t go to the bank very often to be honest. Carrie does everything online. But I have to admit the new doors you describe would be enough for me to shift my money elsewhere. It’s not as if any one bank is much better or worse than the others. Who came out of the banking crises untarnished? Not many. What I have noticed is how in recent years how downright grovelly everyone in my bank has got. If I have to queue more than two minutes some obsequious minion sidles up beside me to apologise for the delay. I can’t be jugged with all of that. I really hate all that “Suit you, sir!” fawning that goes on. Especially because all those who’re tasked with salvaging the bank’s image aren’t the ones who sullied it in the first place. Living in a very small town, I was surprised when our bank adopted this system when none of the banks in larger towns have even thought about it. Sure, it feels like a plexiglass cattle shute and I did "run into" the inner door the first time as I failed to wait for the one behind me to shut. That said, the fun of living in a small town is that there is hardly ever a soul in front of you so the bank teller often waves hello as you wait for that little light to turn green and let you in. i had the misfortune of getting 'air locked' in that bank the other day with a wellie wearing, silage stinking farmer. i knew it was going to happen as i approached the front door. he entered first and i took a large gulp of air to see if it would sustain me through the ritual of waiting for the green light. however the said silage spreader did not know how to work the entrance system and tried a number of times to push pull and finally shake the crap out of the door before i breathed out to show him he had to press the green button. he was lucky i didn't leave my lunch on the perfectly cleaned see through doors.